Posted on Thu, Mar 15, 2012 : 8:24 a.m.
U-M said it was able to improve its ranking by making judicious cuts in the face of economic constraints. 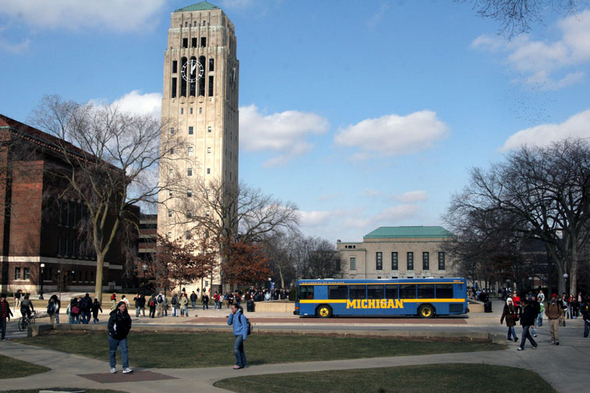 The University of Michigan moved up one spot in the 2012 Times Higher Education World Reputation Rankings, bucking the trend of lower rankings for most U.S. universities, the Detroit Free Press reported. U-M rose from 13 to 12 on the list. U-M spokesman Rick Fitzgerald told the Free Press the ranking is a reflection of how carefully the university has made cuts in tough economic times. Other U.S. universities’ drop on the list was attributed to cuts in state and federal aid. Read the Detroit Free Press article. Contact Cindy Heflin at 734-623-2572, or cindyheflin@annarbor.com or follow her on Twitter. Sat, Mar 17, 2012 : 4 a.m.
Fri, Mar 16, 2012 : 12:05 p.m.
Why would my comments be hidden because I filed an abuse against my post before I posted it? Thu, Mar 15, 2012 : 5:31 p.m.
Xmo, &quot;budget cuts equal improved education&quot;---that's so awesome you said that! Thu, Mar 15, 2012 : 5:21 p.m. I do not have numbers because Progressives/Liberals are emotional and facts do not matter. I am simply saying that I have heard nothing but how Gov. Snyder is cutting the University budgets since he took office. (I think you agree on this point) Now a report comes out and states that U of M has moved up in its educational stature. One could concluded that: Budget cuts equal improved education? Fri, Mar 16, 2012 : 12:04 p.m.
You do not have numbers to support you statement because you think other people are too emotional? wow. Thu, Mar 15, 2012 : 3:51 p.m.
@xmo If you are talking about Rickster and the Republicans tying the hands of the UM in stem cell research, you are correct. If you are talking about meddling into UM affairs by passing a bill that GSA's are not employees, you are correct. If you talk about cutting $56 M from UM's state appropriation this year, you are correct. As from the numbers, UM is one of the top Universities in the world, in spite of Rickster and his Republicans. Thu, Mar 15, 2012 : 1:55 p.m.
WHY are we suddenly saddled with the huge typeface for comments? Annoying. Thu, Mar 15, 2012 : 1:40 p.m.
xmo, Please list or describe any specific plan, action, policy or directive implemented by Governor Snyder since taking office that could be credited with this improved ranking. Supporting data would be greatly appreciated! Thu, Mar 15, 2012 : 1:35 p.m. I guess Gov. Snyder plans are working, even though we hear all of the screams about budget cuts devastating education. Thu, Mar 15, 2012 : 1:10 p.m. But according to Gov. Snyder, UM needs its state budget slashed. How out of touch is this guy? Sat, Mar 17, 2012 : 1:19 p.m.
UM seems to be doing just fine with the budget cuts. Looks like Snyder's education policies are turning out to be pretty effective.